From the Hancock County Court House, go 2.6 miles northeast on Hwy 22/15 to the split and then go right on Hwy 22 for another 9.9 miles to the cemetery. The cemetery will be on the left side of Hwy 22. On same gravestone as Laura S. Jones. On same gravestone as W. Marshall Jones. On same gravestone as Effie H. Stewart. On same gravestone as Jessie R. Stewart. On same gravestone as Eunie Chapman Stewart. On same gravestone as William T. Stewart. m. Feb 16, 1930 to Gertrude Stewart Cooper. m. Feb 16, 1930 to William Jerry Cooper. On same gravestone as Cornelia D. Stewart. On same gravestone as Henry M. Stewart. "In loving memory" On same gravestone as Allene H. Veazey. On same headstone as Marvin L. Veazey. On same headstone as Rosa Nell Veazey. On same headstone as Andrew Pryor Veazey. Maiden name per obituary. s/o Pryor and Rosa Nell W. Veazey. "Pa". Mar'd Mary Fannie Veazey Oct 13, 1930. "Grannie." Mar'd Alex Stephen Burnley Oct 13, 1930. On same headstone as Irene H. Lewis. On same headstone as Lester C. Lewis. No death date as of summer, 2002.
d/o Elizabeth and J. O. English. m. Aug 9, 1917 to Eunie J. Jernigan. m. Aug 9, 1917 to Albert Redick Jernigan. On same headstone with Lois Smith Jones. On same headstone with Henry C. Jones. On same headstone as Ethel Lee Johnson. No death date as of summer 2002. On same headstone as James Herman Johnson. On same headstone as Rosa Lee Thomas. On same headstone as Forest F. Thomas. On same headstone as Nellie Jones Rogers. On same headstone as Joe Marshall Rogers. In same lot as Joe Marshall and Nellie Jones Rogers. m. April 9, 1955 to Lucy Johnson Barnes. Masonic emblem. m. April 9, 1955 to Loyd Allen Barnes. "Charlie". Beside Kelsie Seals James. On same headstone as Sally J. Seals. On same headstone with Marshal N. Seals. On front side of large 4-sided marker. Married to Allison D. Seals (on 2nd side). w/o Allison D. Seals. On 2nd side of large 4-sided marker. d/o Alison D. and Geraldine E. Seals. On 3rd side of large 4-sided marker. Corp Co. D, 3 Ga Cav. w/o J. F. Nelson. "Thy life was beauty, truth, goodness, and love." d/o A. S. & J. V. Cooper. "From Mother's arms to the arms of Jesus." s/o J. V. & Dr. A. S. Cooper. "Darling we miss thee." w/o Dr. A. S. Cooper. On same headstone as Ethel R. Rainwater. w/o Dr. J. T. Andrews. "Mother"
s/o E. L. and Rossie L. McKinley. Stone has fallen over. w/o E. L. McKinley. "Asleep in Jesus, blessed sleep/ From which none ever / wake to weep." On same headstone as Maggie Smith Jones. 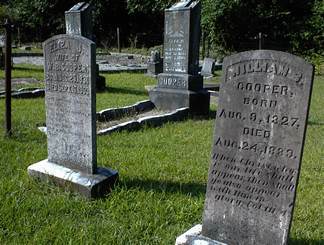 On same headstone as William B. Jones. d/o E. C. and A. L. Chapman. w/o Dr. J. J. Cooper. "He giveth His beloved sleep" Broken headstone. w/o J. A. Cooper. "She made the sacrifice of unselfish love." (Died in) "California Cloudburst 1932". "A Christian Gentleman faithful unto Death"
"In memory of our mamma, wife of S. N. Chapman"
w/o H. M. Wynne, d/o Dr. A. S. & Anna M. Cooper. "She was too good, to gentle and fair to dwell in this cold world of care." w/o Dr. A. S. Cooper. "She was a kind and affectionate wife, a fond mother, and a friend to all." w/o W. B. Cooper. "Here lies one who in this life was a kind mother, a true wife, She was by many virtues blest, and piety among the best." "In loving remembrance of our Mother"
On same headstone as Nannie J. Johnson. On same headstone as William T. Johnson. He served in France 1918-1919. Masonic emblem. "He lived that the less fortunate might survive." s/o Mr. & Mrs. F. B. Jones. "Servant of God well done! Rest from thy loved employ. The battle fought, the victory won, enter thy Master's joy." s/o J. H. and R. L. Human. "We can safely leave our boy, our darling, in Thy trust." "and children..." - see graves immediately following this one. On large gravestone with no dates. On large gravestone and described as child of Jim Boyd Channell. On large gravestone and described as a child of Jim Boyd Channell. Husband of Leona Ogletree Jones, m. Dec 2, 1934. On back of headstone: Children-- Frankie, Harvey, Wiley, Merlene, Nell & Sandra. m. Wiley Cranston Jones, Dec 2, 1934. On same headstone as Wiley Cranston Jones. Husband of Mae Stewart Ogletree. On same headstone as Lula N. Ogletree. On same headstone as John T. Ogletree. On same headstone as Hassie L. Ogletree. On same headstone as Alvin B. Ogletree. Woodmen of the World emblem. At foot of John J. Williamson. 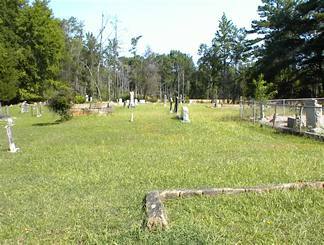 Within the Thomas plot surrounded by iron fence. w/o A. B. Thomas. "Having finished life's duty, She now sweetly rests." Within the Thomas plot. "Not dead but sleeping." Within the Thomas plot. Co D, 3 Ga Inf. Next to Rebecca H. Stewart. On same headstone as Laura C. Howell and Joseph T. Howell. On same headstone as Jessie S. Howell and Laura C. Howell. On same headstone as Jessie S. Howell and Joseph T. Howell. Headstone broken - lying in Howell plot. w/o D. C. Brake. Headstone broken - lying in Howell plot. Brick wall about 4 feet high and 9 feet long surrounds the grave. Masonic emblem. On same headstone as Penelopy Stewart. On same headstone as Mary J. Stewart Lewis. On same headstone as William J. Lewis. Co. D, 15 Ga. Inf. "Father" On same headstone as Hattie Walker Stewart. "Mother" On same headstone as Douglas S. Stewart. On same headstone as Golden B. Stewart. On same headstone as Annie Rebecca Stewart. d/o W. M. & A. L. Wheeler. On same headstone as Bertha S. Barksdale. On same headstone as Ira F. Barksdale. d/o Ira Franklin and Bertha Stewart Barksdale. d/o S. C. & M. E. Leonard. "An angel visited the green earth and took the flower away." s/o S. C. & M. E. Leonard. Stone is lying loose. s/o S. C. & M. E. Leonard. Stone is lying on the ground. "None knew her but to love her." "She lives with us in memory still." w/o John A. Herfel. "Mother, thou art now at home". Top of headstone is missing. The name "Veazey" is on the bottom. "Gardner sleeps beneath the sod, While his spirit dwells with God. Sleep __ Thy rest." Stone is broken and only parts of the inscription can be read. s/o J. A. & M. A. Herfel. "In heaven there is our angel." "I have fought a good fight, I have finished my course. I have kept the faith. 2 Tim IV. 7." Co I, 49 Ga. Inf. w/o T. W. Rainwater. "Rest Mother, Rest in Quiet Sleep while Loved ones in Sorrow over thee weep." Aged 75. "Weep not. She is not dead but sleepeth. Luke VII 52." No dates. w/o W. F. Darden. "She was a kind and affectionate wife, a fond mother and a friend to all." "Never a Mother by Birth But Always a Mother in Spirit." In small fenced area with Alva C. Rainwater. w/o C. A. Gravitt. "Closed are thy sweet eyes from the world of pain, but we trust in God to meet thee again." d/o C. A. & E. M. Gravitt. "On the bright immortal shore we shall meet to part no more." s/o O. B. & A. D. Herndon. "In loving memory of" "Cremated in Miami, Fla"
"An honest man gone to his reward." On same headstone as Thomas J. Lewis. On same heastone as Pearl D. Lewis. s/o J. T. & E. B. Reid. Aged 25 years 10 mos & 11 days. "Dearest Charlie thou art sleeping, beneath the lonely sod, But thy soul is in Jesus' keeping. Thy home is with thy God." Infant s/o C. W. & E. N. Peacock. Shares gravestone with Marshall Ney Seals, Jr.